Made-for-TV movies are usually the trademark of the Hallmark and Lifetime channels. Usually these small screen films are about stories that made minor headlines, create heartwarming sentiment, or are semi-popular properties that can generate a small profit. 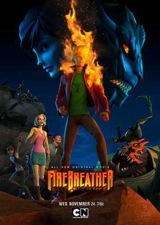 Firebreather fits the latter description in a feature length film that premiered on November 24, 2010 at the height of the Thanksgiving weekend. The movie is based off the comic series of the same name released by Image comics. Duncan Rosenblatt lives in a world inhabited by humans and creatures called Kaiju. The Japanese monster movie buffs will recognize “kaiju” as a term used to describe such beloved beasts as Godzilla, Mothra, and other monsters from tokusatsu entertainment. In Firebreather, the Kaiju are intelligent monsters that seek that total destruction of humankind. Sixteen years prior to the film’s opening, the Kaiju attacked led by their 120 foot tall king, Belloc who stopped the invasion after meeting the human woman Margaret Rosenblatt. Their union produced our hero, Duncan, who has orange skin, abnormal strength, and above average teenage angst issues that stem from his obvious differences. Despite being half-human, half-Kaiju, Duncan lives a relative normal life with his ultra-supportive mother, except that he eats coal for breakfast and transfers schools on regular basis due to his tendency to get into fights. On his first day at his new school, he meets and falls in love with Jenna, the school’s “it” girl, and is bullied by the local jocks, including Troy—Duncan’s obvious rival and Jenna’s ex-boyfriend. His day starts with biology class and frog dissection, protested by Jenna and his new friend Isabel—a self-proclaimed Kaiju fangirl. He also meets Kenny Rogers (Duncan makes the apt joke “Do you know when to hold them, when to fold them?”) who is the local weird kid and he also has a crush on Isabel. 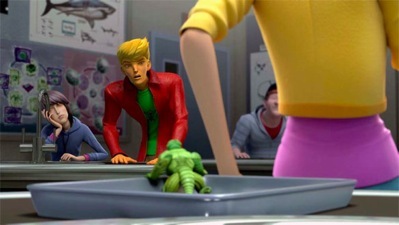 While Jenna and Isabel protest the inhumanities of frog dissection, Duncan notices a small Kaiju, mistaken for a frog corpse, on Jenna’s desk. He causes a big scene to capture the monster and he later shows it to Isabel, winning her affection and Kenny’s disapproval. Duncan moves onto gym class and every child’s nightmare: dodgeball. He and Kenny are pitted against Troy and his goons. Troy expects to easily beat the new boy, but Duncan amazes everyone with his mad dodgeball skills. We also discover that the gym teacher, Coach Barnes, has a shared history with Duncan. Angered by his defeat, Troy challenges Duncan, who refuses to fight based on a promise he made to his mother. He uses his heightened abilities to run away, but Troy refuses to back down. Infuriated at Troy, Duncan’s rage fuels a new power: fire breath. Coach Barnes comes to Troy’s rescue and chastises Duncan’s conspicuousness. It turns out that Coach Barnes (AKA Colonel Barnes) is affiliated with some sort of government organization slated to monitor Duncan and ensure that his abilities don’t garner attention. The plot progresses with Duncan and Troy forced to clean up the remains of their fight, when Isabel tells her new friend about a party. Duncan attends in hopes of wooing Jenna, only to be attacked and kidnapped by his father Belloc. Indignant about his capture and being ignored for sixteen years, Duncan demands Belloc release him. The Kaiju King only laughs and informs Duncan that he should be proud if his heritage and living with humans has made him soft. He then gives an ominous warning that a war is about to start between humans and Kaiju. As his son Duncan has no choice but to enter the conflict. Duncan doesn’t want to take part in a war, but his protests are cut short after Belloc proclaims him his heir in front of an assembly of Kaiju, and then dumps him into a lake of molten magma. 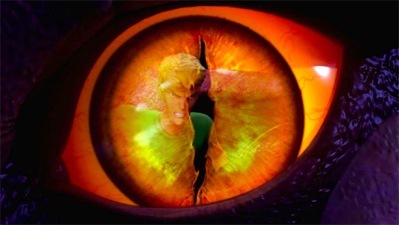 Duncan bursts from the magma in his Kaiju form, a cross between a human and an orange dragon. Imagine a super-saiyan from Akira Toriyama’s Dragon Ball Z with orange skin and a glowing crystal in his chest, and you pretty much have the basic idea. The movie starts to follow a formulaic, action-packed plot after Duncan’s transformation. Duncan must continue to deal with regular teenage tribulations, except now he is regarded as a hero at school for fending off Belloc. He must also fight the Kaiju that pop up to challenge his claim as heir. Col. Barnes is an instigator at this point, only wanting to annihilate the Kaiju. Belloc interestingly surrenders in order to be closer to his son. One would think that Duncan would be focused on ways to defeat his newfound enemies, but he’s more preoccupied with taking Jenna to prom. The prom is interrupted by another Kaiju attack and Kenny’s jealously that that Isabel has a crush on Duncan. Through the help of his friends and family, Duncan defeats the enemy Kaiju. He also gets a girlfriend, his father’s respect, and a pair of wings. Firebreather is all about teen angst with a plot about a war between humankind and Kaiju thrown in as an afterthought. You can make a checklist of all the teen drama stereotypes that were in this movie: social outcast, crush on most popular girl school, a bully jock, father issues, parentless party, prom, and eventual acceptance into the social hierarchy. The writers were obviously trying to appeal to the teenage demographic. If you ignore the above list, the movie actually has an interesting plot: a teenage boy of mixed parentage must balance the two sides of his personality and save the world from a catastrophic war. Similar stories have been done before, but the fun part comes from Duncan relying on his Kaiju side to prevent destruction. Monsters in many cartoon series are evil, but here we have a character who is part monster as the hero. The old adages, appearances are deceptive, don’t judge a book by its cover, beauty is only skin deep, etc. are prevalent. Viewing the animation was like watching a game of Sim City. The characters’ movements were stiff and you could easily imagine where an animator clicked his mouse to control their actions. 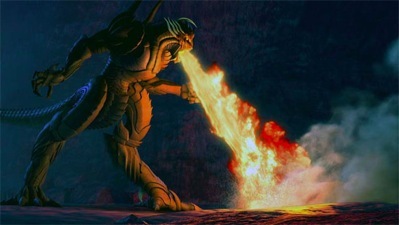 The CGI was better than the mass-produced, computer animated cartoons such as The Penguins of Madagascar and Jane and the Dragon, but it can hardly be compared to a big-budget animated film. For a made-for-TV movie, the quality served its purpose. The movie’s biggest strength was its voice acting. There were several well-known names attached to the project. Dante Basco, famous for his role as Prince Zuko in Avatar: The Last Airbender, voiced Kenny. Dana Delaney played Margaret Rosenblatt; she has also voiced Lois Lane in the DC animated universe. Josh Keaton, who voiced Troy, and Kevin Michael Richardson as Belloc, have lent their voices to many animated projects over the years. Peter Chung directed the film. Chung is a veteran of hand drawn animation and this was his first foray into CGI. His influence is heavily noted in the action scenes. Chung is best known for his creation Aeon Flux and his work on The Animatrix. Firebreather is worth watching for the fun factor. This movie feels like a pilot for a half-hour TV series and maybe Cartoon Network will develop one if they receive enough positive feedback. It won’t change your life but Firebreather will keep you entertained for an hour.